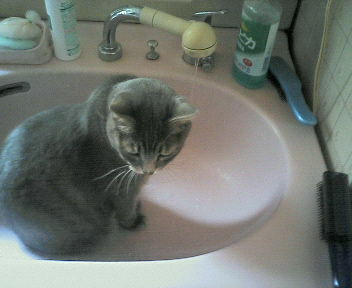 She's my cat, PICKEY:) This morning, my cat came to bath room, and she sit down on sink when I washed my face. She seemed to want me to turn ont the water, ( I knew her feeling from her face) so I did so. Pickey started to drink water from bibcock. My mom and I laughed at her!! It's so cute!! !I looked at her, and then she started to fight with water. But she was beaten by water soon because cats hate getting wet so much, you know:) She cried and run away....It's so fuuny and cute:D!